Conan Exiles, will be making its console debut on Xbox One in Spring 2017 as part of the Xbox One Preview program! It’s the ultimate barbarian survival experience where you can crush your enemies, see them driven before you, and fight your way to the top of the food chain in a harsh and unforgiving landscape. As an exile, cast from your home and left to die on a cross in an unfamiliar place, you must chart your own path across a desert wasteland where bloodthirsty cannibals, dangerous creatures, and vicious flesh-searing sandstorms dot the landscape. Craft tools and weapons, gather food and water, build shelters, and dominate your enemies through brutal combat to forge your legend in this unforgiving world. To set Conan Exiles apart from others in the survival game genre, we’re creating unique gameplay features inspired by Conan’s universe. Capture and enslave NPCs to work for you, recover magical artifacts from the ruins of ancient civilizations, and use them to craft much-needed resources. You can also worship the Hyborian gods who will aid you in combat and let you summon their mighty avatars to help crush your enemies. 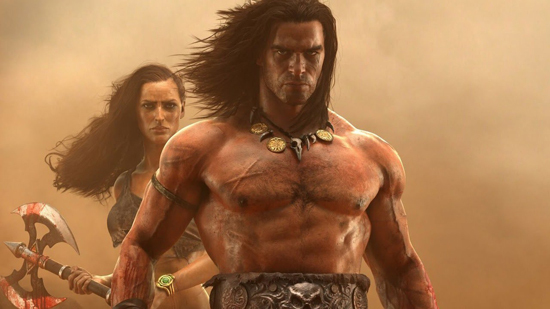 Conan Exiles can be played in local single-player or on private and public servers. While we (Funcom) are initially known for our work in MMOs, we’ve started to branch out to other genres and gameplay experiences for the past couple of years; making a survival game is another step in that process.